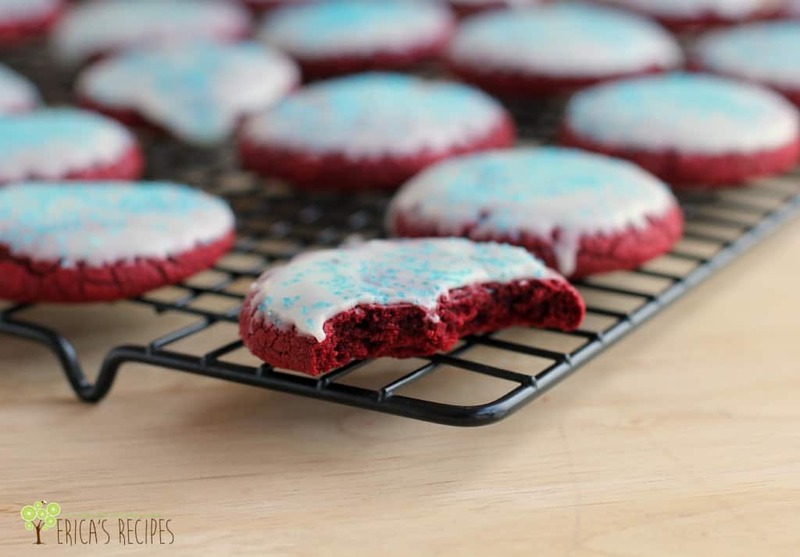 Super easy to make thanks to boxed cake mix, ‘Murica Red Velvet Cake Mix Cookies are a fun way to show American pride for your next holiday party. Every patriotic American holiday, my daughter and I make some kind of red, white, and blue food. Red velvet cupcakes, sugar cookies with colored frosting and sprinkles – last 4th of July, we made strawberries dipped in white chocolate and blue sprinkles. But we always make something patriotically colorful and festive to celebrate. ..afterall, we Americans are over-the-top with our patriotism, especially on these holidays. Being an Army veteran, I’m no exception. Cuz ‘murica. 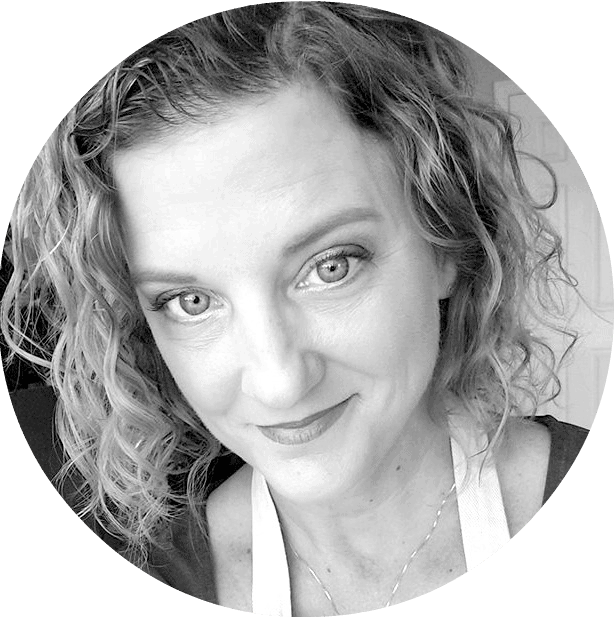 So, these cookies… Well, puttering around my kitchen, I headed into the pantry to dig and see what I could come up with. 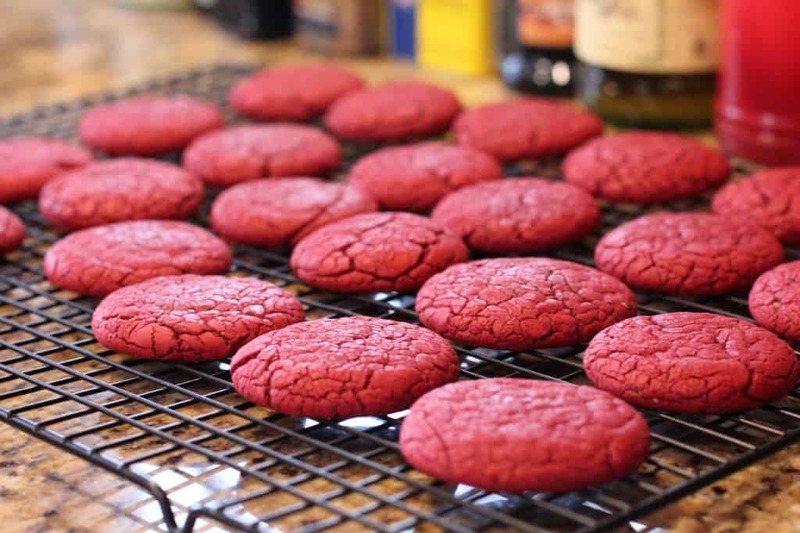 Having remembered seeing somewhere on the interwebs about using cake mix to make cookies, the light bulbs went off when I found a box of red velvet. Score. The rest of the ingredients were things I had on hand as well. 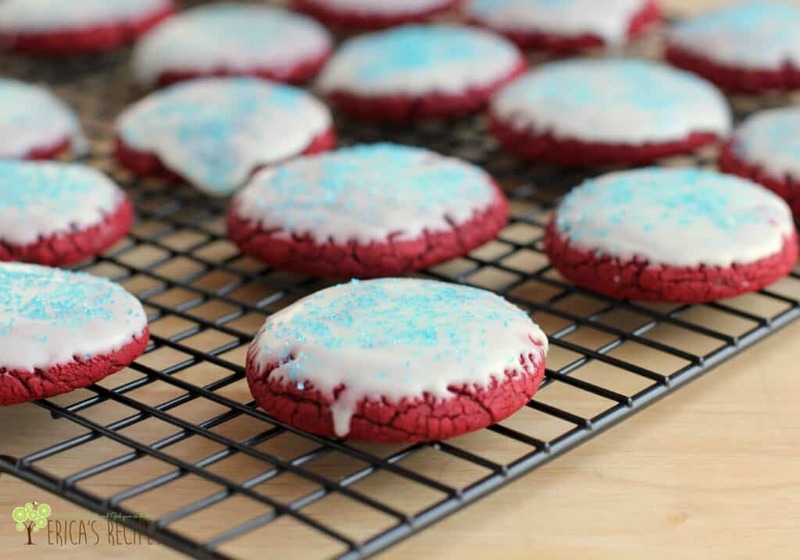 So a little while later, we had yummy red, white, and blue cookies! To make the cookies: In a mixing bowl, combine the cake mix, eggs, and oil with a wooden spoon to make a dough. Form into 24 (1-1/2-inch) balls and put on cookie sheets. Using the palm of your hand, flatten each cookie a bit. Bake at 350F for 7-8 minutes until they just start to get a little firm around the edges. Transfer to a rack to cool completely. To make the white chocolate glaze: In a medium mixing bowl (glass is best), microwave the white chocolate morsels and shortening 45 seconds. Whisk until smooth (morsels will continue to melt during this). Whisk in the powdered sugar and milk until smooth. Take a cooled cookie and dip the top into the white chocolate glaze. Let the excess drip off, then put back of the rack. 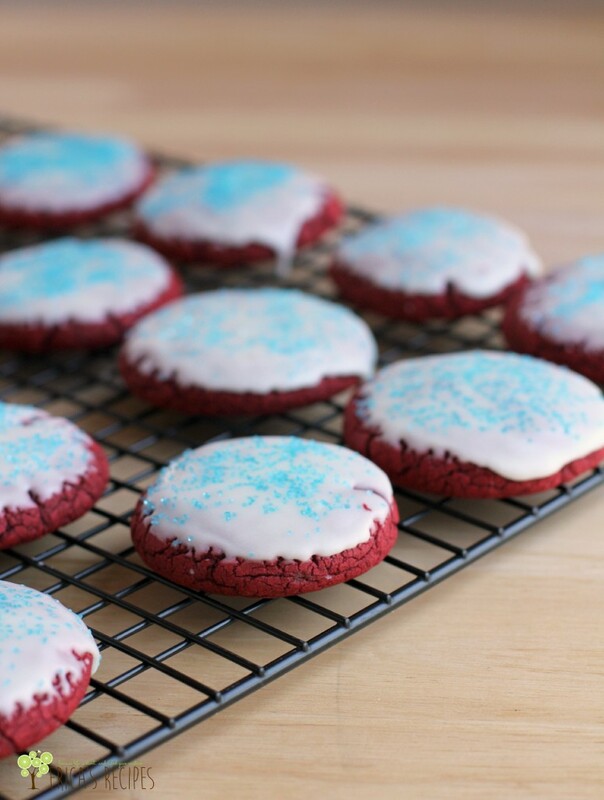 Sprinkle glazed cookie tops with the blue sugar sprinkles. Allow to sit for the glaze to harden. Yield: 24 cookies. Over time, the food coloring from the cake mix will bleed into the glaze. So I don't recommend making these further in advance than the day of when you want to serve them. I love these patriotic cookies!